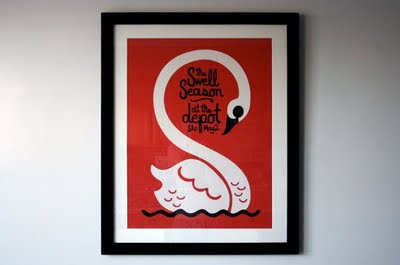 We finally framed and hung our killer Swell Season screen print poster that we scored from the wonderful Signed & Numbered for last year's show at The Depot. We love looking at this thing in our dining room. For those of you who are unsure of who the Swell Season actually are, they're basically the dood and chick from the hit indy flick Once. Here's a little refresher from none other than Upto12. Nice! And their return here in November is already sold out.